In September 1955, shortly after fourteen-year-old Emmett Till was murdered by white supremacists in Mississippi, his grieving mother, Mamie Till Bradley, distributed to newspapers and magazines a gruesome black-and-white photograph of his mutilated corpse. The mainstream media rejected the photograph as inappropriate for publication, but Bradley was able to turn to African-American periodicals for support. Asked why she would do this, Bradley explained that by witnessing, with their own eyes, the brutality of segregation, Americans would be more likely to support the cause of civil rights. For All the World to See: Visual Culture and the Struggle for Civil Rights, a nationally touring exhibition from NEH on the Road, opens November 8, 2015 at Cape Fear Museum of History and Science. 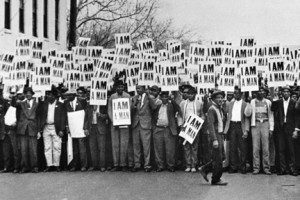 Through a compelling assortment of photographs, television clips, art posters, and historic artifacts, the exhibition traces how images and media disseminated to the American public transformed the modern civil rights movement and jolted Americans, both black and white, out of a state of denial or complacency. Visitors to the immersive display will explore dozens of compelling and persuasive visual images, including photographs from influential magazines, such as LIFE, JET, and EBONY; CBS news footage; and TV clips from The Ed Sullivan Show. Also included are civil rights-era objects that exemplify the range of negative and positive imagery—from Aunt Jemima syrup dispensers and 1930s produce advertisements to Jackie Robinson baseball ephemera and 1960s children’s toys with African American portraiture. For All the World to See is not a history of the civil rights movement, but rather an exploration of the vast number of potent images that influenced how Americans perceived race and the struggle for equality. View the exhibit at a free opening reception on Sunday, November 8 from 2-4 p.m. Enjoy live music by Jerri Holliday. Special activities for children will be offered and guests will have an opportunity to view fans and other portable art from the Museum’s collection. Refreshments will be served. For additional exhibit programming, visit www.capefearmuseum.com/programs. For All the World to See: Visual Culture and the Struggle for Civil Rights was curated by Dr. Maurice Berger, Research Professor, The Center for Art, Design, and Visual Culture, University of Maryland, Baltimore. It was co-organized by The Center for Art, Design, and Visual Culture and the National Museum of African-American History and Culture, Smithsonian Institution. For All the World to See has been made possible through NEH on the Road, a special initiative of the National Endowment for the Humanities (NEH). It has been adapted and is being toured by Mid-America Arts Alliance (M-AAA). Founded in 1972, Mid-America Arts Alliance is the oldest regional nonprofit arts organization in the United States. For more information, visit www.maaa.org or www.nehontheroad.org.